System Restore is one of those programs that can be a life-saver when you've been the unfortunate recipient of unstable software, a badly timed power outage, or a damaging thunderstorm. System Restore records important documents, settings, and preferences on your computer at a certain point in time. If the unthinkable happens and your computer files are damaged or inaccessible, you can use System Restore to put your computer back the way it was before the data was lost. It's good to get into the habit of creating a system checkpoint (called a restore point) anytime you're preparing to add new software that you've downloaded from the Internet or anything else that you suspect might make your computer unstable. If anything goes wrong with the installation or the program causes a conflict, you can restore your computer to the point just before you began the installation. 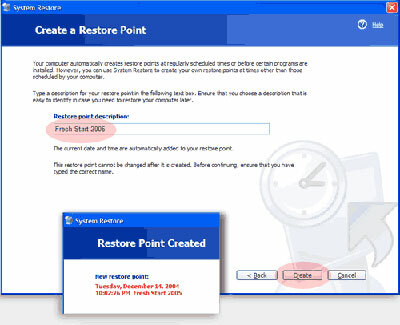 Note: System Restore automatically adds restore points to your computer daily and before you install device drivers, automatic updates, unsigned drivers, and some applications. Click Start, and choose All Programs. Point to Accessories, then point to System Tools, and then choose System Restore. When the program begins, choose Create a restore point and click Next. Enter a description of the restore point (such as "Starting fresh 2005") and click Create. After a few seconds, the program will tell you the date, time, and description of the new restore point. Click Close to exit System Restore. JahnsTek is a Web Design and IT Consulting firm owned and operated by Justin Jahns and currently based out of Madison, WI. More info About JahnsTek, more info about Justin. All content Copyright JahnsTek, LLC unless otherwise noted. Awesome Inc. theme. Powered by Blogger.